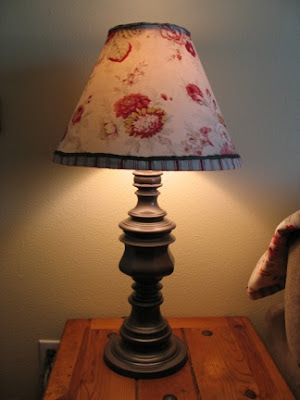 Ever since I got my beautiful end tables at Savers, I have been searching for lamps to go with them. I had been to all of the sales and thrift stores several times, not finding what I wanted. Even on sale, a new lamp is very expensive! I finally gave up on finding what I wanted and decided to try and make what I wanted. 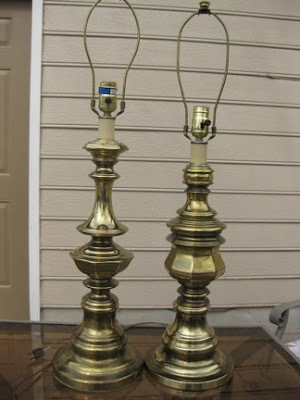 I found these very heavy brass lamps at DI (thrift store) for $5 each. I roughed them up with some sand paper so the paint would stick. 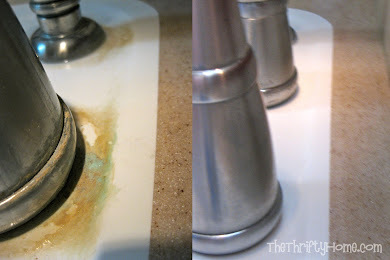 Then I sprayed them with automotive primer and then with Rust-Oleum Hammered spray paint. I thought the lamps looked much better, even though they were not exactly what I had wanted. I wanted something more natural looking (wood, wicker, etc.) in a dark brown. I then went in search of lamp shades and found 2 on clearance at Walmart for $2 each. I covered them in some leftover material that I had. The shades were not the shape that I had wanted, but were only $2 each. After I covered them in material, I decided they were too busy and matchy. At least I had lamps and only spent a total of $20 for them (cost of all supplies and lamps) instead of $100. Yesterday I went thrifting at Savers and found the lamps I had been dreaming of! I will take pictures and post soon! Great job! It's amazing what a can of paint can do. Oh, and the right eye to see an old item's potential. I would have gotten hung up on the lamp shades. 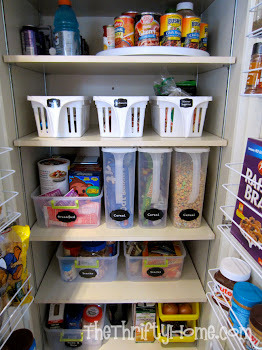 Thrifty homemaking requires some creativity, sigh. 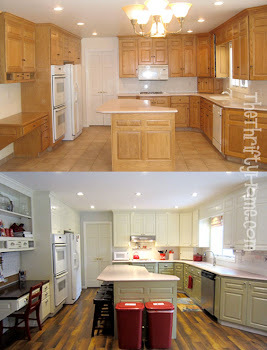 Just thinkin' - since you are so good at this, you should try selling refinished items - like "flipping" a house. 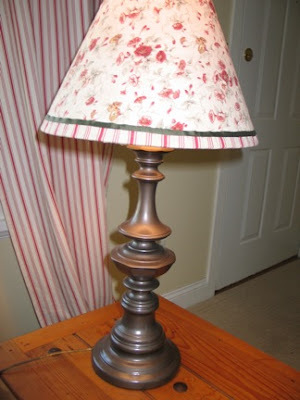 Those lamps turned out great!